BORDEAUX CLASSIFICATIONS: DO THEY HAVE RELEVANCE AND VALUE? Anyone who has looked even casually at the wines of Bordeaux has encountered a classification of some kind. In this long-established wine region, assessing and ranking estates has been a preoccupation since the 1700s. There are five classifications of Bordeaux wines currently in effect; of these, the most consequential for collectors and investors dates from 1855 and applies to the finest wines of the Médoc and Sauternes. The others have mid-20th century origins, addressing Saint-Émilion and Graves along with two groupings of more modest Médoc properties, Crus Bourgeois and Crus Artisans. It should be noted at the outset that Pomerol remains unclassified, an aberration which speaks volumes about the arcane nature of Bordeaux codification. The term cru appears in all Bordeaux classifications and seems to resonate with wine aficionados; yet it remains confusing to many, with good reason. Translated as “growth,” it is employed in numerous French wine regions – for example, the Rhône, Alsace, Champagne, and Bourgogne – but with significant variations in meaning and application. Normally, cru is intertwined with appellation and is not an independent classification. In Bordeaux, cru on the label may imply all shades of quality from mid-level to the pinnacle and stands apart from appellation as such. That said, there is the paradoxical exception of Saint-Émilion Grand Cru, an official appellation unless followed by the word “Classé”. This subject is indeed rather complicated if not convoluted! The history of classifications of Médoc bourgeois and Saint-Émilion has been particularly rocky. While the requirement to revise these particular hierarchies periodically is laudatory, in practice the process provokes controversy and, sometimes, legal challenges from those downgraded or excluded outright. Since 2010 the Crus Bourgeois are established annually. In the 2014 vintage there are 278 châteaux. Despite having chartered sensible criteria and practices, they have omitted labels such as Chasse-Spleen and Siran. Although it fails to include some notable properties, the Cru Bourgeois designation may still have value, particularly for traditional European customers. As for the Saint-Émilion ranking, its once-a-decade revisions have been even more turbulent, but may finally have arrived at a largely plausible outcome albeit with a large share of “firsts” (18 of 82 properties, or 22%). The process is now under the control of government agencies, but what will happen the next time is anyone’s guess. It is the Classement of 1855 which is our main focus. It did not arrive out of the blue: there were earlier attempts to categorize the wines of Bordeaux. Thomas Jefferson, then a minister for the United States, toured French vineyards and put forward a personal list of the best Bordeaux wines in 1787. His handwritten assessment (Fig. 1) makes fascinating if rather difficult reading. Others followed, including André Simon (1800), Tastet-Lawton (1815) and Wilhelm Franck (the last in 1845). The trend culminated in the now-famous classification developed at the instigation of Emperor Napoleon III for the Exposition Universelle de Paris in 1855. It bore a resemblance to the rankings of Lawton and Franck. Clive Coates MW in Grands Vins observes that the brokers or courtiers who were charged with making the selections based their judgements on prevailing reputations and prices; less known is that recent vintages were also subject to blind tasting. A reasonable person would realize that the rankings reflected the way things were in the mid-1800s; they could not be expected to remain exactly the same two hundred years later. Nevertheless, 1855 endures to this day, a nearly immutable document (Fig. 2, an extract of the original). There has been only one deliberate alteration: the elevation of Mouton Rothschild to Premier Cru Classé in 1973. Historically rather isolated from other parts of the region, the Right Bank was notably absent from 19th century rankings. Clive Coates explains that the estates “had more humble proprietors” and “fetched greatly reduced prices” compared to those of the Médoc. Even now, many Right Bank estates still do not enjoy the stature of their Left Bank peers owing in part, it could be argued, to the undue influence of the 1855 classification. Saint-Émilion was classified in 1954 for the first time, with several revisions, the last in 2012. Pomerol, once relatively unknown, stands as a case apart. The absence of a Cru Classé system held back its best properties for a very long time, but that has been corrected in recent years: many Pomerols now figure among the most expensive wines of the region. It may come as a surprise that the 1855 Classification applies to the brand or producer, not a specific vineyard; in other words, a château has the right to sell its land or add to its holding without jeopardizing its place in the Classification. There have been many such transactions since 1855, and the total vineyard area of the Classified Growths and the total volume of wine have increased substantially. Looking at the classified châteaux from the perspective of their prices from 1982 to 2005, Benjamin Lewin MW calculates in What Price Bordeaux? that “only 28 of the 61 châteaux would still remain in their original price groups.” A few would warrant a higher placement, notably Palmer, Lynch-Bages, Pontet-Canet and Grand-Puy-Lacoste. There would be new wines to place with the rarified “best” such as Pavillon Rouge du Château Margaux and Château Latour’s Les Forts de Latour. Others would drop a grade or two, and some labels such as Lynch-Moussas, Croizet-Bages and Belgrave would no longer merit inclusion among the top tier of Médoc wines. 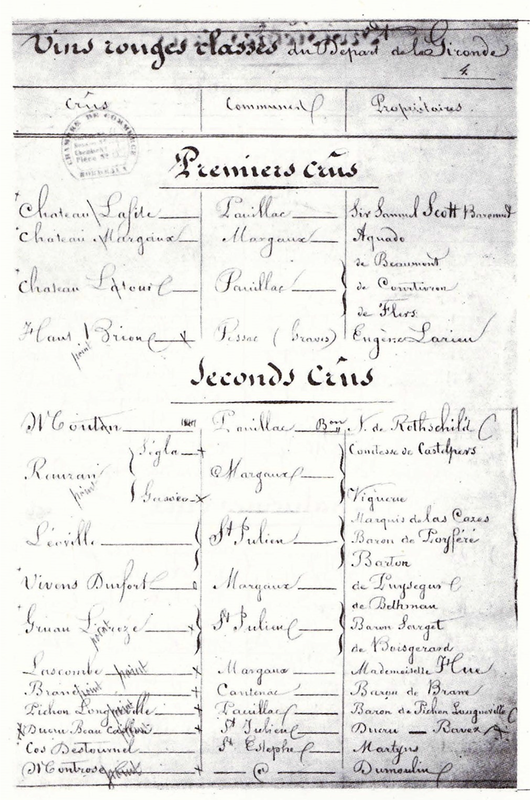 Lewin reckons that some unclassified châteaux – Haut Marbuzet, Sociando-Mallet, Phélan Ségur and Gloria – could rightly claim membership in a revamped 1855 classification as “perennial under-performers” no longer make the cut. Going further, a classification of the finest Bordeaux wines should by all rights encompass all deserving candidates throughout the entire region. Clive Coates is one who compiled such a list, revised in the mid-1990s for Grands Vins. He deemed the First Growths, for example, to include the four of 1855 (Latour, Margaux, Lafite, and Haut-Brion) plus Mouton-Rothschild, buts he adds Pomerol’s Pétrus along with Ausone and Cheval-Blanc of Saint-Émilion. Should Pavie and Angélus, elevated to the “A” group of Saint-Émilion Premier Grand Cru Classé in 2012, join the other Firsts? What about La Mission Haut-Brion, which now commands top dollar? It was recognized in the 1953 Graves classification but was not mentioned in 1855. Questions persist and the answers are elusive. It is worth noting that the wine of the era leading up to the 1855 Classement was unlike contemporary red Bordeaux. It was based on a differing mix of grape varieties, underwent a short fermentation and contained rather low levels of alcohol and tannin. In some cases and markets, it was beefed up by more powerful wines from the Rhône, or hermitagé. The merchants, not the estates, typically created the ultimate blend and bottled the wines. In other words, not only has the position of many individual châteaux within the 1855 ranking evolved significantly, when judged by relative price; so has the actual taste profile of the wines themselves. It is fair to say that any method or system to assign an average, enduring rating to winegrowing estates will inevitably have shortcomings and flaws. A property may excel in one vintage and underperform in the next. Owing to unforeseeable occurrences and the passage of time, ownership and personnel change as do the age of the vines and indeed the actual composition of the vineyards. With sufficient investment and skillful winemaking, new, non-classified properties may produce wines equal or superior to those which enjoy a formal ranking. This phenomenon has occurred in recent years in Bordeaux with so-called “garage” wines. Therefore, to remain valid, a classification should be reviewed and revised regularly. Yet, the 1855 Classement remains rigidly intact, leaving the marketplace to set the true value and rank of each property. In sum, classifications are an imperfect guide to the wines of Bordeaux. 1855 is incorrectly interpreted by some as representing all the very best wines of the region, when it focuses on the Médoc (and Sauternes). Even there, the hierarchy of 1855 is only partially valid today. No wonder most château owners are opposed to a revision. The classifications of Saint-Émilion or the Crus Bourgeois, which incorporate periodic reassessments, remain comparatively more relevant. However, any classification tends to be a partly subjective – if not political – exercise and cannot be considered exhaustive or precise. Ultimately, there is no substitute for knowing the individual properties, classified or not. Figure 1. The Thomas Jefferson classification of 1787 in his own hand. Among many interesting comments, he writes that three of his top wines, “Margau” (Margaux), “la Tour de Segur” (Latour), and “Hautbrion” (Haut-Brion) “are not in perfection till 4 years old” whereas those of “de la Fite” (Lafite) “being somewhat lighter, are good at 3 years.” This speaks to the tastes and practices of the day, when red Bordeaux was far less concentrated and tannic than modern vintages (Extract appears in Pijassou, R., Le Médoc, Tome II © Librairie Jules Tallandier, 1980). 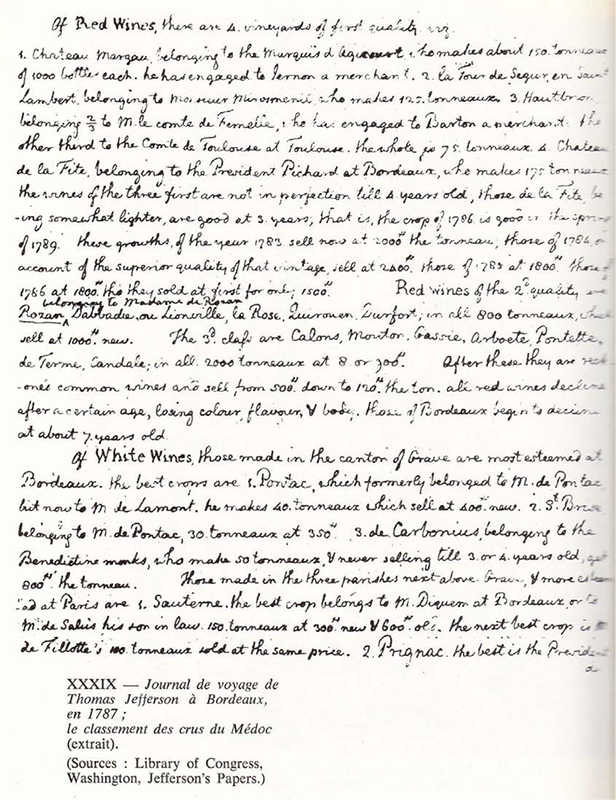 Figure 2 .The first page of the original, handwritten Classement de 1855. Wines were ranked in order of quality – not alphabetically – within each growth or “crû” (cru is the current usage). Note Mouton Rothschild at the head of the Seconds Crûs, promoted to First Growth in 1973 (Extract from Archives de la Chambre de Commerce de Bordeaux reproduced in Pijassou, R., Le Médoc, Tome II © Librairie Jules Tallandier, 1980). Brook, S. Are classifications a waste of time? Decanter, The Bordeaux Issue, 2011. Coates, C. Grands Vins – The Finest Châteaux and Their Wines. University of California Press, 1995. Lewin, B. What Price Bordeaux? Vendange Press, 2009. Pijassou, R., Le Médoc. Librairie Jules Tallandier, 1980. Robinson, J.; Harding, J. Classification. The Oxford Companion to Wine, 4th edition. Oxford University Press, 2015.